In the Zhongnanhai leadership compound in central Beijing, three handsome cars owned by Elon Musk, CEO of Tesla Inc., were parked. The U.S. tech entrepreneur showed the electric vehicles to Chinese Premier Li Keqiang after their meeting on January 9, two days after the groundbreaking ceremony of the company's first overseas factory, the 50-billion-yuan ($7.37-billion) Gigafactory 3 in Shanghai. Musk told Li that he was impressed by China's speed and efficiency. In July 2018, he was spotted grabbing a Chinese breakfast jianbing on a street in Shanghai during his visit to sign contracts with municipal authorities for the project. Just half a year later, he came again for the start of construction and this time, he chose Chinese hotpot. Musk also tweeted his discussion with Chinese Vice President Wang Qishan on China's "history, philosophy and luck." Although his interest in Chinese food and culture is genuine, a bigger attraction may be the huge auto market potential. China has been the world's largest manufacturer and buyer of automobiles for 10 years. However, the year 2018 marked a turning point for China's auto market, which portended challenges but also opportunities, especially for new-energy vehicle (NEV) makers. According to a report released by the China Association of Automobile Manufacturers (CAAM), a top industrial body, the country's car production and sales in 2018 showed a negative growth after 28 consecutive years of expansion, declining by 4.2 percent and 2.8 percent, respectively, year on year. However, clean-energy vehicles turned in a solid performance, with production and sales leaping by 59.9 percent and 61.7 percent on an annual basis, reaching 1.27 million and 1.26 million units, respectively. "NEVs will become a growth driver in the next two years. It is estimated that by 2020, the sales of NEVs in China will reach 2 million units," Shi Jianhua, Deputy Secretary General of the CAAM, said at a national conference in December 2018. Musk has collimated the emerging market which coincides with Tesla's strength. Knowing that Musk is willing to visit China often, Premier Li offered him a Chinese green card for permanent residency. While Tesla's new gigafactory is on its way, the Chinese market has already given the green light to the giant corporation. On June 28, 2018, the National Development and Reform Commission (NDRC) and the Ministry of Commerce issued a shortened negative list of sectors off-limits or restricted to foreign investors. It states that China will cancel foreign equity caps for special-purpose vehicle and NEV makers, allowing foreign carmakers to set up wholly owned subsidiaries in China. This new policy replaced the one from 1994 stipulating that Chinese companies must account for at least 50 percent ownership in a joint venture with foreign carmakers. Moreover, China also plans to cancel foreign equity caps for commercial vehicle makers in 2020 and for passenger vehicle makers in 2022. The restriction that one foreign investor cannot have more than two joint ventures in China will also be lifted, according to the NDRC. 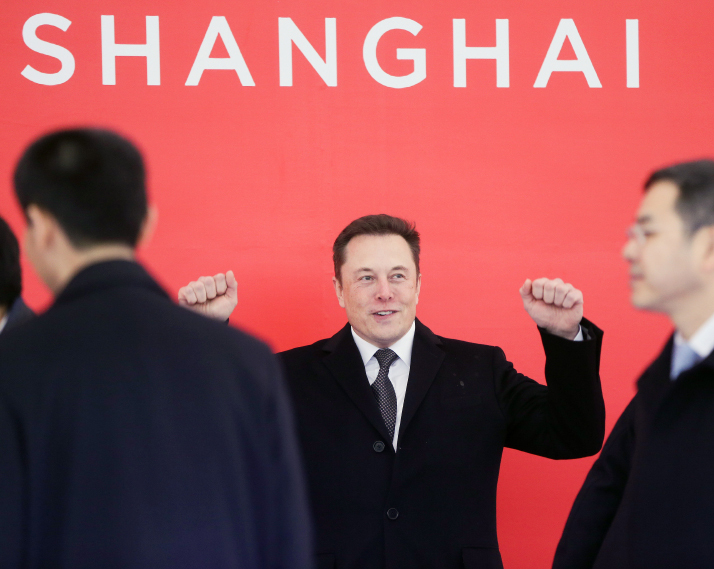 Tesla's Shanghai plant benefits from the reform, becoming China's first wholly foreign-owned automobile manufacturing plant. Policies play a big role in China's automobile market. While encouraging openness and introducing foreign investment in the automotive sector, China is also highlighting policies on stimulating and regulating the development of NEVs. In 2017, the Ministry of Industry and Information Technology launched a policy which requires most automakers' annual sales of NEVs should reach a threshold from 2019. For passenger vehicle companies that produce more than 300,000 conventional cars annually, the number of NEVs sold should account for 10 percent and 12 percent of their total output in 2019 and 2020, respectively. Otherwise they will need to buy NEV production credits from other enterprises or face a fine. In addition, a new guideline released by the NDRC took effect on January 10 to control additional fuel vehicle capacity and supervise NEV projects to avoid blind investment and slash overcapacity. In addition, approvals on qualifications for NEV manufacturers will become stricter. However, 2019 doesn't bring only good news for NEVs, as government subsidies for them are likely to fall further this year, and be completely canceled by 2020. Although there has been no official confirmation, the market is seeking new growth opportunities. Song Qiuling, Deputy Director of the Economic Construction Division of the Ministry of Finance, said at a forum in September 2018, "In the NEV industry's preliminary stage, government subsidies play a crucial role in pushing forward its growth. As the industry grows with its production and sales both exceeding 1 million units, the policy does not satisfy the need for high-quality development and global competition." Tesla's Shanghai plant is expected to be one of the most advanced in the world, with an annual capacity of 500,000 electric vehicles, according to its plan. Its 16-billion-yuan ($2.36-billion) first phase will produce 250,000 lower-end Model 3 and Model Y cars annually, which will challenge China's domestic brands. But as China's electric vehicle market matures and subsidies are eliminated, all automakers will be in the same pool under fair competition. "Tesla's China production will have a 'catfish effect' on the country's auto industry, pushing domestic carmakers to speed up their technological upgrading," Cui Dongshu, Secretary General of the China Passenger Car Association, said. 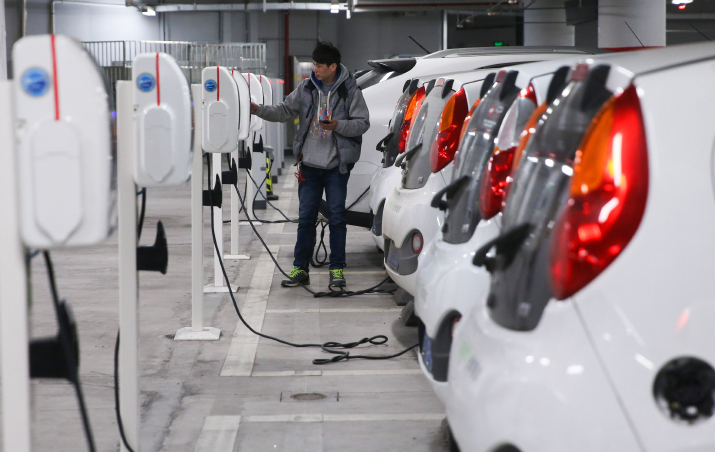 Hu Enping, Director of the Brand and PR Department of the Beijing Electric Vehicle Co. Ltd., a NEV manufacturer, expressed his concerns about the withdrawal of subsidies and fiercer competition in the market. "It is the biggest and most complicated challenge," he told Beijing Review. "We should think about how to balance cost and quality, promote sales and brand recognition, and maintain a leading role in a fully competitive environment." Hu predicted that there would be an inevitable brand war in the NEV sector in approximately 2020. But competition is absolutely a good thing. As traditional automakers and NEV startups learn from each other's advantages and make up for their own disadvantages in the process, it will boost the overall performance of the industry, according to him. "The emergence of more brands will facilitate the industry's healthy development. To make the pie bigger, first we have to acquire more opportunities," Hu said. However, there are bottlenecks for the emerging industry such as a lack of power supply and charging infrastructure, low battery capacity and energy storage problems. "But there are opportunities in electrification, which will bring about a centurial transformation for the auto industry," Hu said. According to him, electrification will alter a car's properties from a mechanized product to a smart product. It will transform the industrial ecology as a car will no longer be a single tool but possess various scenarios with the help of information technologies. It can also improve user experience by providing customized services instead of industrialized products. "In the future, competition will not happen with a single product, it will be a competition of brands and overall capacity," Hu said. "The expansion of competition is pressing us ahead in forging core competitiveness."